Last month, I officially began my PhD research. Not surprisingly, the difference from any prior research I’ve ever done is quite evident. Primarily because there is really no horizon at all when you embark on a PhD. The difficulty here essentially boils down to finding an answer to the following question: What problem is worth spending the next five years of your life trying to solve? I already have an idea of the broad area that I’d like to look into. Digging deeper and deciding which boundary to push at, however, is the tricky part. 1) Read a paper. Creativity and optimism will immediately kick in, pointing you to potential opportunities and gaps, causing a rainbow of ideas to explode out of your brain. You shiver with excitement. 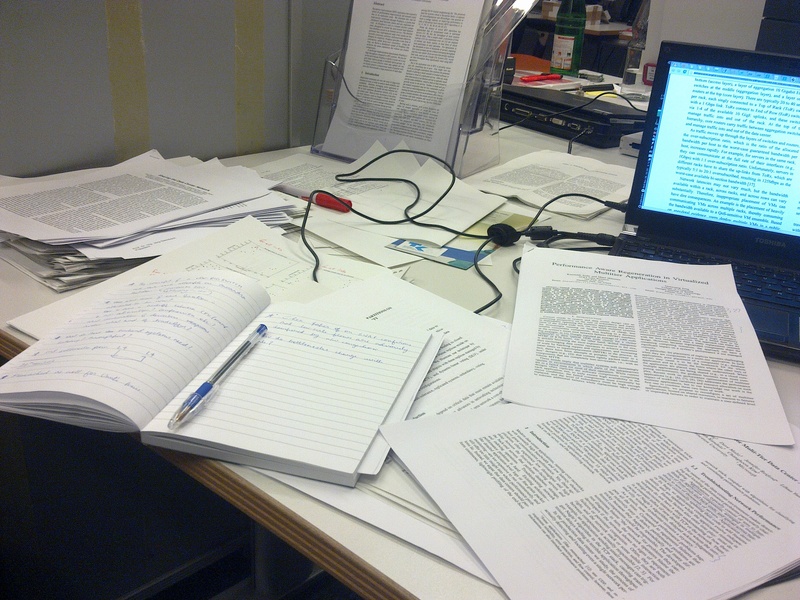 2) Read another paper only to realise someone else has already done all of that and a little more. Let’s see how long it takes before I finally break from step 1. I’m not sure how I should end this post, so here’s a picture of my desk. This entry was posted in Research on November 28, 2012 by lalithsuresh.